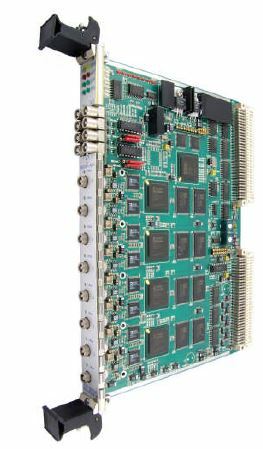 The SIS3300/1 is an 8 channel 6U VME digitizer/transient recorder with a sampling rate of up to 105 MS/s and 12-bit (14-bit respective) resolution. The board has a width of one VME slot. The use of FPGAs for data handling and implementation of the VME interface allows for maximum flexibility. Acquisition into one memory bank in parallel to readout from the second memory bank in combination with a high speed slave interface allow for the implementation of demanding applications.